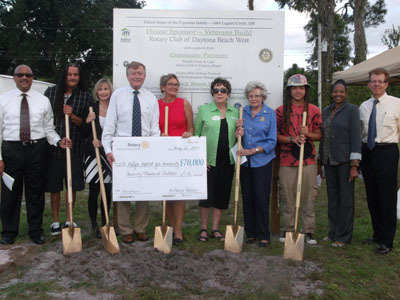 This past year, members of the Rotary Club of Daytona Beach West have worked long and hard to raise a total of $80,000 to help launch a Veterans Build – where Habitat will build a house with a U.S. Military Veteran. Florida Power and Light and a second Rotary club, Daytona Beach Rotary, have joined as community partners to support the build. A Veterans Build is Habitat for Humanity’s national initiative to provide housing solutions and volunteer and employment opportunities to U.S. veterans, military service members and their families. On October 19th, nearly 70 people came out to support the groundbreaking and celebrate the new partnership. Halifax Habitat was honored to have representatives from the United States Air Force, United States Navy, and U.S. Army in attendance along with Embry-Riddle Aeronautical University ROTC (Army, Navy, Air Force) and Mainland High School ROTC (Air Force). Volunteers, Community Supporters, and Advocates rally around a local veteran and his family at the Veterans Build groundbreaking. It’s all interconnected – Rotary Club of Daytona Beach West and community partners help with future home of veteran and family. Members of the Rotary Club of Daytona Beach West present a donation of $70,000 at the event. They have raised a total of $80,000. Larry Volenec, FPL spokesperson, shares about FPL’s involvement as a community partner. FPL donated $10,000 to the build. Join in on the build! Want to join us as we build this home? Halifax Habitat for Humanity will be posting its schedule of upcoming work days for any volunteers who wish to participate in the home build. For more information contact Andy Thompson at andy@halifaxhabitat.org or 386-257-9950.